Welcome to the latest cover reveal with Young-Adult Author Suzanna Williams. 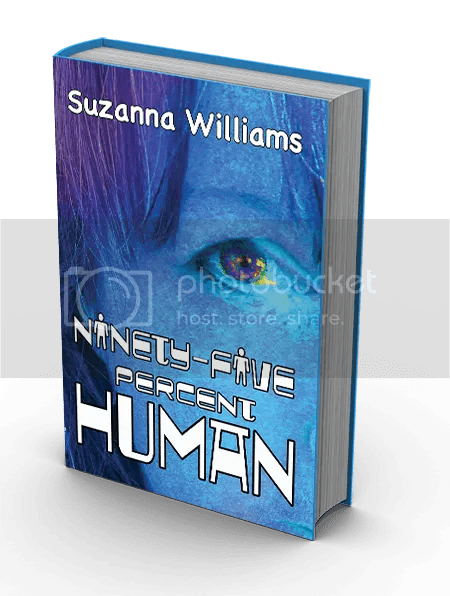 Released today is her latest book, the first in the series, Ninety-Five Percent Human. Teenager, Joe Kendrick, thinks he’s got problems. The farm he’s looked after since his father’s suicide is falling and his brother wants to sell it, his girlfriend has dumped him and his normally down-to-earth Nan starts muttering about seeing UFO’s. And all Joe wants is a ‘normal’ life.Then he saves suicidal stranger, Sarah, from drowning. What Joe doesn’t know is that Sarah is a human/alien hybrid, sent to test the viability of life on Earth, and, as she’s survived hostile aliens are already planning their attack. Ninety-five percent Human is the first in a two-book sci-fi adventure. Suzanna’s known for her first release, ShockWaves which is Free today in honor of the cover release. At the end of the month, the book will be on Tour, check in with The Finishing Fairies for the full tour schedule coming soon. Suzanna Williams is a perpetually eighteen year old YA author who lives in the wild, wet, Welsh borderlands surrounded by ruined medieval castles and Celtic mythology where she looks for UFO’s amongst the stars and imagines all the people she meets have dark secrets. When she is not inventing radical problems for her unsuspecting heroes and plotting their escape, Suzanna is a serial collector of random badly paying jobs and has never found a use for her BSc in Psychology whatsoever. As a child, Suzanna filled notebook after notebook with stories and her first taste of writing success was a poem published in the local newspaper aged just nine years old. She has written and directed several plays and pantomimes before publishing her debut novel, ShockWaves, in 2012. Suzanna loves sci-fi action adventures, playing the piano, believes Romeo and Juliet should have talked more and considers sarcasm to be the highest form of wit. She has a daughter who is a drummer, another daughter who is a driving instructor, a son who is a dancer and a ‘nearly’ grandson she’s dying to meet. Welcome to the Hop and Win Book Blast!